The process of verifying signatures to block a law expanding school vouchers has built up the scrutiny of Secretary of State Michele Reagan’s effort to be more transparent. 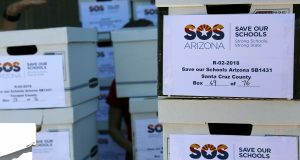 School voucher expansion legislation is on hold after Save Our Schools Arizona delivered, by the group’s count, 111,540 signatures today to refer the law to the 2018 general election ballot. Save Our Schools Arizona claims to have collected enough signatures to temporarily halt the expansion of the state’s Empowerment Scholarship Account program. A top staffer at the Arizona Secretary of State staff denied accusations made by county recorders earlier this week that the office ordered voter registrations to be cancelled without proper documentation. A federal appeals court Friday upheld the state’s process for recognizing political parties, rejecting claims by the Arizona Green Party that the petition deadline for new parties posed an unconstitutional burden. A debate over the merits of a campaign finance overhaul devolved into a spat between Senate Democrats and a top elections official.